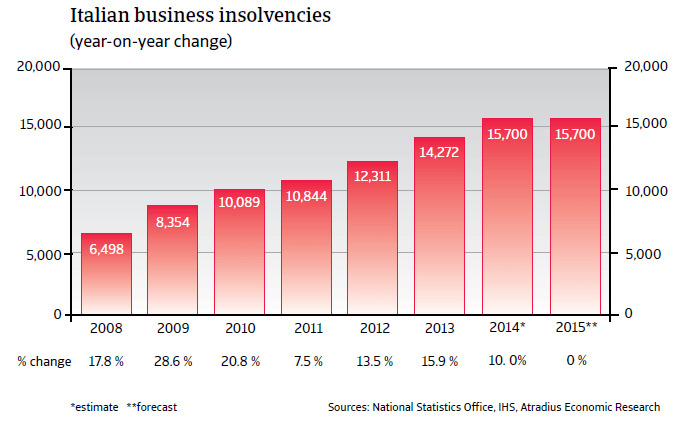 Corporate insolvencies have increased sharply since 2008, up 10% year-onyear in 2014. In 2015 we expect Italian business insolvencies only to level off. Liquidity problems of Italian businesses are exacerbated by continuing poor payment behaviour, especially by the public sector. Moreover Italian companies, compared to their Western European counterparts, show a higher average gearing – especially short-term gearing. Many businesses suffer from the currently restrictive loan policies of many banks, and this is expected to continue into 2015. The high dependence of Italian businesses on bank financing is proving to be a major structural weakness. A rebound on the horizon? 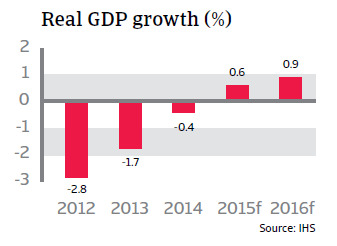 After a 1.7% contraction in 2013 the Italian economy shrank again in 2014, by 0.4%. 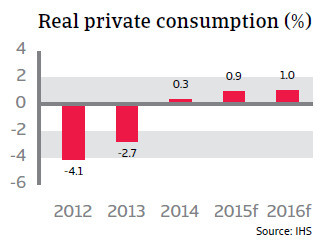 However, private consumption rose 0.3% after sharp declines of more than 4% in 2012 and 2.7% in 2013, when disposable income shrank and consumer confidence reached its low point. Investments continued to decrease, down 3.2% in 2014, in an atmosphere of difficult financing conditions and poor business confidence. 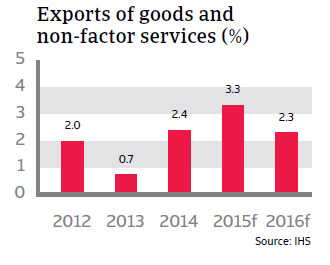 Foreign demand provided only limited support to growth, however, with lower imports, net exports were a positive contributor to GDP growth in 2013 and 2014. After three years of contraction, Italy’s economy is expected to grow by 0.6% in 2015. Domestic demand is expected to stabilise in 2015 as investments level off and growth in household consumption accelerates to a forecast 0.9%. Households’ available income began to increase again at the end of 2014. This is partially due to a EUR 80 monthly tax break for low-paid employees introduced by the government in May 2014. 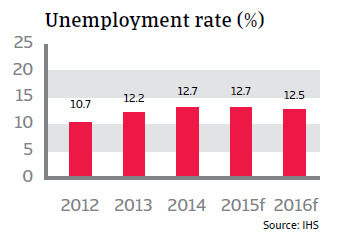 However, unemployment is forecast to remain stubbornly high, at 12.7% in 2015. Consumer prices are expected to decrease slightly, by 0.3%, in line with overall low inflation in the eurozone. Less pressure on international competitiveness? 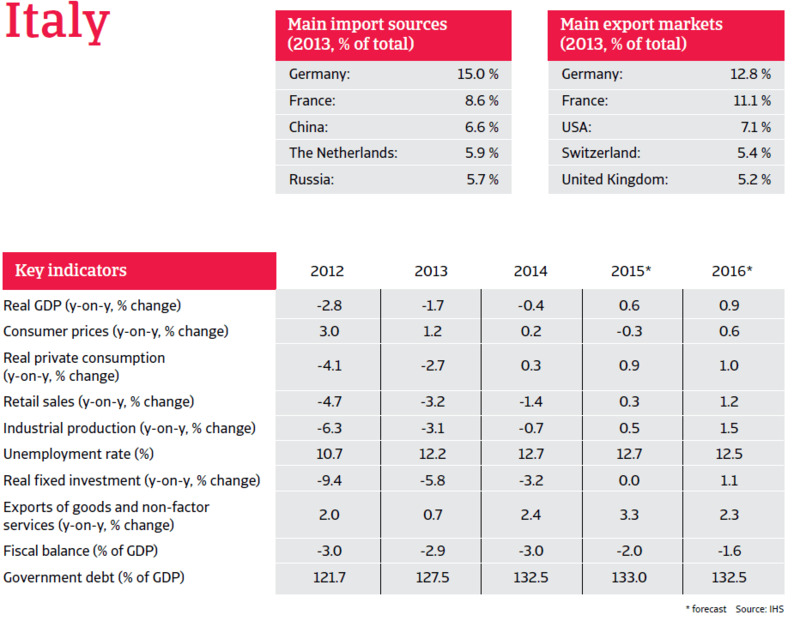 Exports are expected to increase 3.3% in 2015. That said, Italy has lost nearly 20% of its share in its export markets – particularly European markets – over the last couple of years. It has managed to retain its leading position in clothing and textiles though. That said, Italy’s productivity is set to recover somewhat. Given the continued high level of unemployment, wage rate growth should be limited. 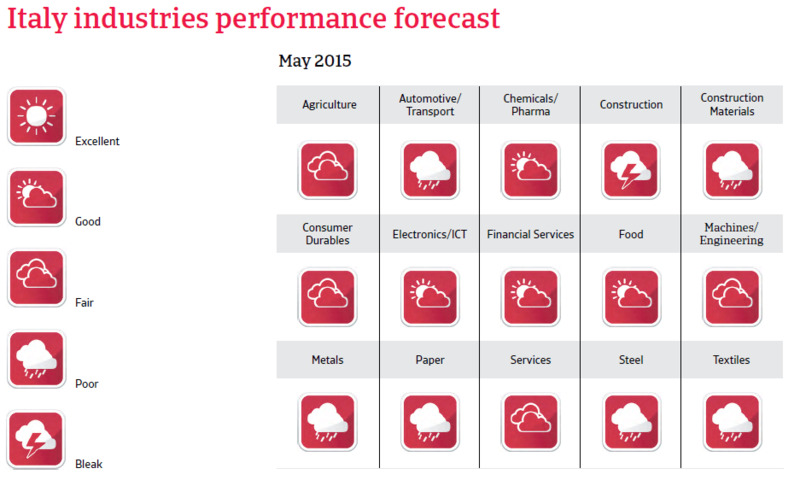 As a result, unit labour cost is expected to improve in 2015. Mainly as a result of a significant decrease in imports, Italy’s current account deficit became a current account surplus in 2013. In 2015 the surplus is expected to grow to 1.7% of GDP following the 1.6% surplus in 2014. An increase in exports is supporting this improvement, but it is mainly the result of subdued demand for imports. Since 2009, non-performing loans as a percentage of regulatory capital have increased sharply, indicating stress in the banking sector. There is a glimmer of light at the end of the tunnel as the ratio of new bad loans is now lower than in the past. However, the volume of loans to the private sector continues to contract, due to tight credit standards and high borrowing costs. In particular, loan provisions to smaller businesses remain constrained. 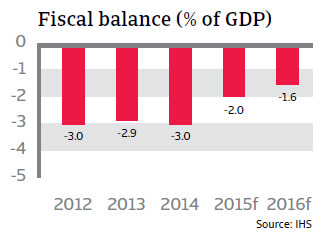 Down to 3% of GDP or even below since 2012, the yearly Italian budget deficit has reached healthier territory. In 2015, the deficit is expected to remain just within the 3% margin. However, the subdued economic performance is expected to result in a sustainable increase in the already high government debt-to-GDP ratio. Despite successful fiscal consolidation, this ratio increased from 121.7% in 2012 to 132.5% in 2014. This was due mainly to the economic contraction, and is therefore expected to rise again to 133% of GDP in 2015. In order to decrease the debt ratio substantially a nominal annual growth rate of 3% would be required. The challenge is achieving the required high level of real growth, while also pursuing fiscal consolidation in a low inflation environment. The Renzi administration successfully passed a bill that gives the government a mandate to push ahead with labour market changes. The current labour market regulations still provide solid protection for those workers on permanent contracts. Because newly hired staff on a permanent contract have the same protection as those who have worked for a company for 30 years, firms are still shying away from such contracts. However legal initiatives to improve judicial efficiency, expand deregulation and contain red tape have been limited so far.